A big, beautiful tree can be a lovely feature of your property, adding character and providing much-needed shade in the summer months. Still, the day might come when it needs to come down. Whether it’s rotting or you need to make room for a new project, it’s your responsibility to know how to cut a tree down safely. It should go without saying, but if at any point during the process you feel the project is too dangerous, do not hesitate to give Mr. Tree a call. There may be a certain pride in taking care of your property all on your own, but it’s never worth putting you or your loved ones in danger. Before you even touch the tree, make sure you are properly prepared for the task. 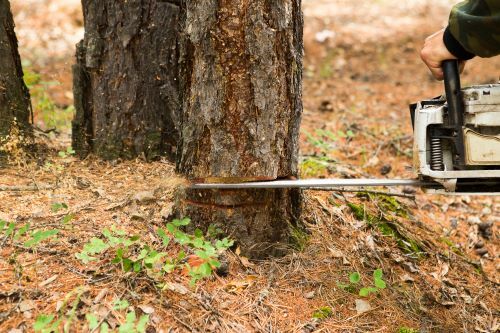 It’s no good knowing how to cut down a tree if you end up hurting yourself or damaging something else on your property. The first thing you’ll need to do is survey the area. Look around the tree for any power lines or other structures that it might catch on the way down. If there are any other people around, be sure they are far away from the tree before you get to work. A good guideline is to keep a distance of at least twice the height of the tree. That way bystanders will be safe from any branches or limbs that may go flying during the felling process. This is also the perfect time to ensure you are equipped with all the necessary safety equipment. A helmet is a necessity here, as you never know if any debris might fall your way. Goggles, gloves, and earmuffs all go a long way as well. If you are using a chainsaw, you might even want to consider protective legwear in the event it drops against you. Knowing how to cut down a tree means knowing how to cut down a tree safely, so take every precaution you can. Once you’ve cleared the area of other people, plan which direction you’ll bring the tree down. If you know the exact height of the tree in question, great! You can use that information to determine how much space you’ll need to clear in the direction you want it to come down in. The larger the tree is, though, the less likely it is you’ll be able to get an accurate measurement. Do the best you can, and in either case, it’s wise to leave some extra room in the felling direction. After you’ve determined that, you’ll need to plan your escape routes. The last thing you want to do if things go sideways is trip over the underbrush, so you’ll want to clear a few paths you can get down if you need to. Once you’ve determined the felling direction, pick 2 different paths at a 45-degree angle in the other direction. Even if you’re well versed in how to cut down a tree, it can still be an unpredictable process. By leaving yourself two emergency escape options, you’ll be prepared if the tree comes down in an expected direction. Once you know the direction you want the tree to fall, you’ll need to cut a notch in the tree to ensure it falls that way. Cutting down a tree involves finesse, not just cutting and hoping for the best. The notch acts as a guide, weakening part of the trunk so that when you do make the felling cut, it breaks in a controlled manner. To create the notch, cut vertically down on the felling side at a 60-degree angle. The notch should be about one-fifth of the tree’s diameter, so be sure to stop before you go too far. Once you’ve created the first cut, you’ll need to create a second one coming up at a 30-degree angle. This cut should meet where your first cut ends, giving you a notch in the tree at a 90-degree angle. When you cut the tree down, this notch will act as a hinge of sorts to help guide the tree down. With your guiding notch in place, you are ready to make the final cut and bring down the tree. Working from the non-felling side of the tree, make a horizontal cut toward the point of the notch. The cut should be horizontal with the ground and parallel with the point of the notch, so take your time to measure the cut. Depending on the width of the tree in question, you may want to use felling wedges to prevent your saw from getting stuck. With bigger trees, it’s possible for the weight of the trunk to pinch a saw in place. Felling wedges can be tapped in behind the saw, keeping the gap open to prevent the saw from getting stuck. The moment you feel the tree beginning to fall, remove the saw and back away from the tree along your planned route. You should never take your eyes off a falling tree, just in case it doesn’t fall where you expect it to. In fact, we would advise you to recruit someone as a lookout for the whole process. Having an extra set of eyes to watch for falling branches or to let you know if the tree starts leaning in the wrong direction might just save your life. Now that you’re armed with the knowledge of how to cut down a tree, you’re ready to do so safely and precisely. But as we’ve said before, there is no reason you have to go it alone. If at any point you feel the task is too much for you to handle, there’s nothing wrong with seeking the help of a professional. At Mr. Tree, we’re ready and willing to help with any tree care services you might need. Whether that means cutting down an old tree or planting a new one, we’re here to help.